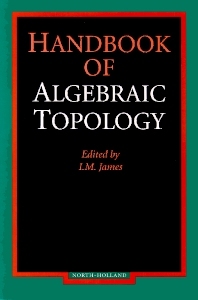 Algebraic topology (also known as homotopy theory) is a flourishing branch of modern mathematics. It is very much an international subject and this is reflected in the background of the 36 leading experts who have contributed to the Handbook. Written for the reader who already has a grounding in the subject, the volume consists of 27 expository surveys covering the most active areas of research. They provide the researcher with an up-to-date overview of this exciting branch of mathematics. Foreword. List of Contributors. Homotopy types (H.-J. Baues). Homotopy theories and model categories (W.G. Dwyer, J. Spalinski). Proper homotopy theory (T. Porter). Introduction to fibrewise homotopy theory (I.M. James). Coherent homotopy over a fixed space (K.A. Hardie, K.H. Kamps). Modern foundations for stable homotopy theory (A.D. Elmendorf et al.. Completions in algebra and topology (J.P.C. Greenlees, J.P. May). Equivariant stable homotopy theory (J.P.C. Greenlees, J.P. May). The stable homotopy theory of finite complexes (D.C. Ravenel). The EHP sequence and periodic homotopy (M. Mahowald, R.D. Thompson). Introduction to nonconnective Im(J)-theory (M.C. Crabb, K. Knapp). Applications of nonconnective Im(J)-theory (K. Knapp). Stable homotopy and iterated loop spaces (G. Carlsson, R.J. Milgram). Stable operations in generalized cohomology (J.M. Boardman). Unstable operations in generalized cohomology (J.M. Boardman et al.). Differential graded algebras in topology (Y. Felix et al.). Real and rational homotopy theory (E.H. Brown, Jr., R.H. Szczarba). Cohomology of groups (D.J. Benson, P.H. Kropholler). Homotopy theory of Lie groups (M. Mimura). Computing v1-periodic homotopy groups of spheres and some compact Lie groups (D.M. Davis). Classifying spaces of compact Lie groups and finite loop spaces (D. Notbohm). H-spaces with finiteness conditions (J.P. Lin). Co-H-spaces (M. Arkowitz). Fibration and product decompositions in nonstable homotopy theory (F.R. Cohen). Phantom maps (C.A. McGibbon). Wall's finiteness obstruction (G. Mislin). Lusternik-Sohmirelmann category (I.M. James). Subject Index.